The American Gem Trade Association sponsors The Spectrum Awards contest to promote the use of colored gemstones in fine jewelry. 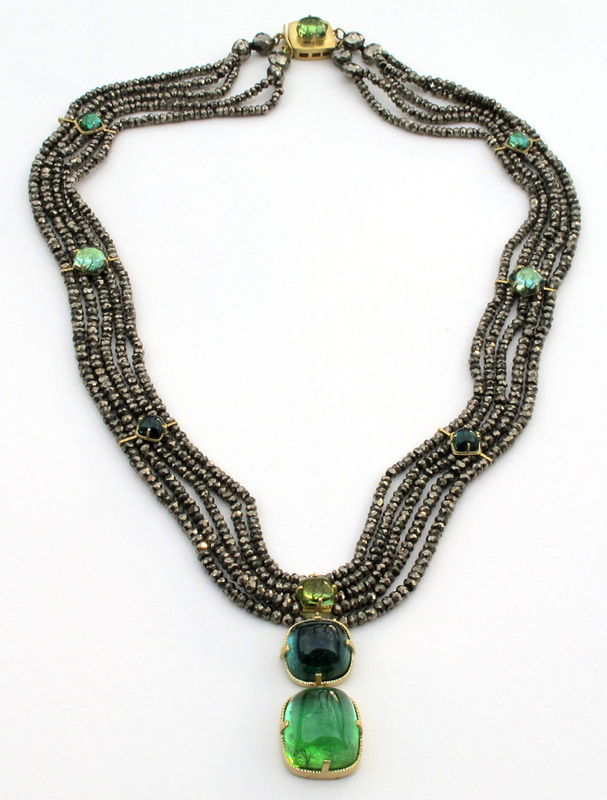 This necklace is my entry in the 2012 AGTA Spectrum Competition. Green tourmalines with pyrite beads. 18k gold. ©Mimi Favre 2011. The necklace features two cushion shaped green cabochon tourmalines and faceted pyrite beads. Pyrite isn't a gemstone--it's iron. However I loved the warm metallic color and used it as a compliment to the two large tourmalines. 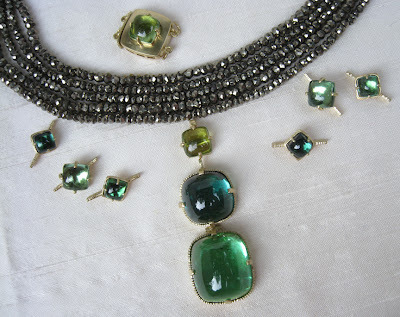 The larger 22 carat tourmaline is a fine mint green color with flash of aqua. The smaller 10.9 carat square tourmaline is strong blue-green. Pre-stringing- spacers, clasp, center pendant. ©Mimi Favre 2011. I was sifting through my collection of stones not entirely certain of what type of jewelry to make. However I knew that I wanted to use the two large tourmalines. 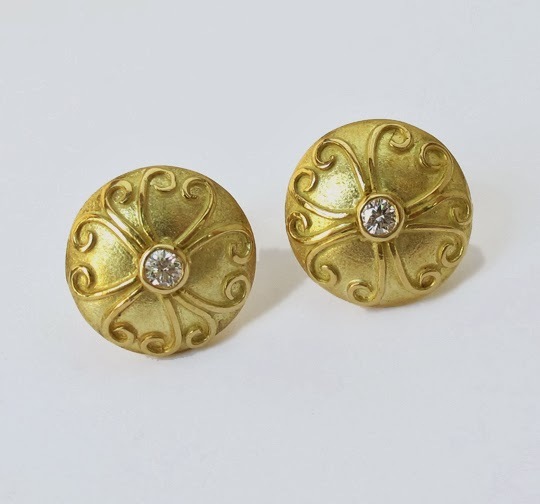 Combining the mellow gold pyrite with the cushion shape cabochon tourmalines suggested a vintage color combination--like a vintage piece from the 1920's. Tourmalines 18k gold. ©Mimi Favre 2011. The somewhat irregular hand faceting of the beads suggested to me that the settings also needed a hand applied textural element. I created settings for the tourmalines in 18k gold which have a deliberately unrefined sawtooth edge and prongs. 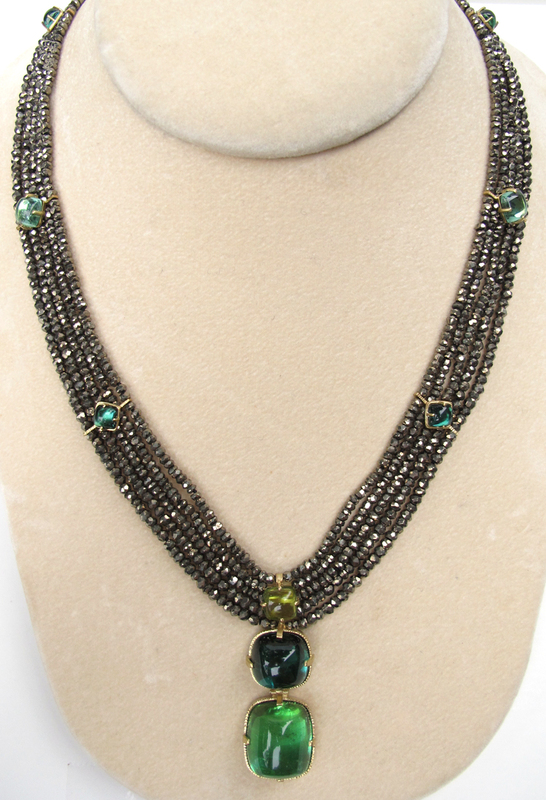 Five strands of varied size pyrite beads form a flat ribbon affect. Stringing was a bit challenging because each line had to be a different length to fit the contour of the human neckline. I added 18k gold spacers also with sawed texture and set with smaller square tourmalines to guide the five individual strands. 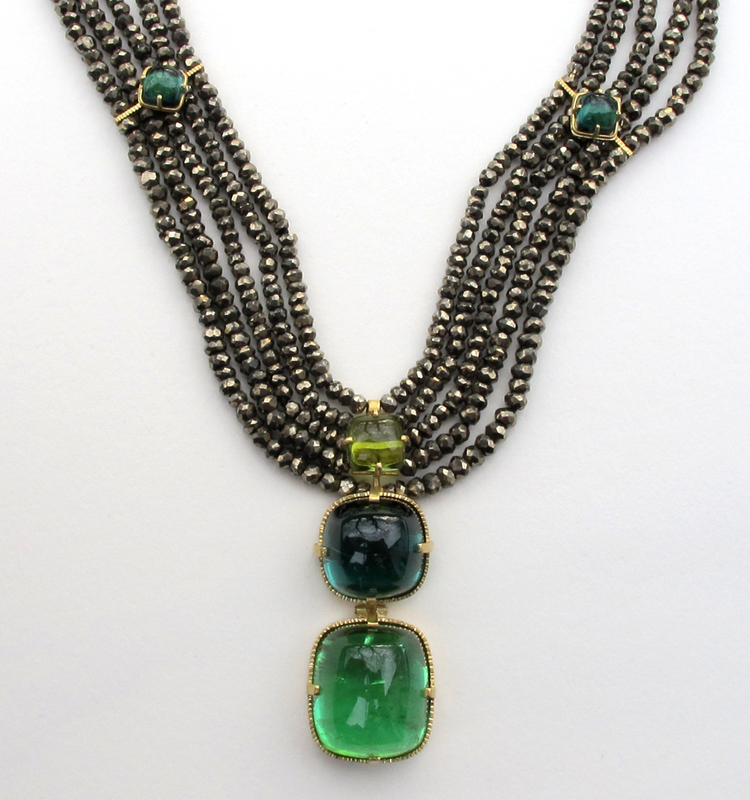 Tourmaline and Pyrite Necklace © Mimi Favre. Finished Necklace is 18-19"(not including pendant). Good luck with your entry. It certainly reflects the Art Deco period. Love the colour. Thank you! The competition has been judged--go the AGTA link to see photos of the entries.